“It’s been a nonstop summer for David Garcia as he campaigns to win Arizona’s Democratic primary in August, in the hopes of unseating Republican Governor Doug Ducey in November. If recent polls are any indication, he’ may very well get that chance to become the Democratic gubernatorial nominee. For now, Garcia enjoys the confidence that comes with a hefty lead in the polls over his primary opponents, Kelly Fryer, a businesswoman and former minister, and Steve Farley, the state Senate Assistant Minority leader. While the latest filings from the Arizona Secretary of State show Farley slightly ahead in fundraising, a poll release by Data Orbital shows Garcia ahead with 33 percent support against 11 percent for Farley and 6 percent for Fryer. However, the same poll showed that half of Democratic voters are still undecided. Garcia does go into a primary election with the wind on the back of an anti-Trump movement. “I was endorsed by the same organizations as Stacey Abrams and Andrew Gillum,” said Garcia. Abrams is a black woman who won the primary to be the Democratic candidate for governor in Georgia, and Gillum is the black mayor of Tallahassee, FL who has declared his candidacy for Governor of Florida. A former Army veteran turned professor of education at Arizona State University, Garcia was canvassing the working class neighborhoods of Phoenix in early June as the temperature hit 100 degrees before noon. Unperturbed, Garcia and his supporters returned to their home base where volunteers were preparing hamburgers and fruit salad for the overheated workers. 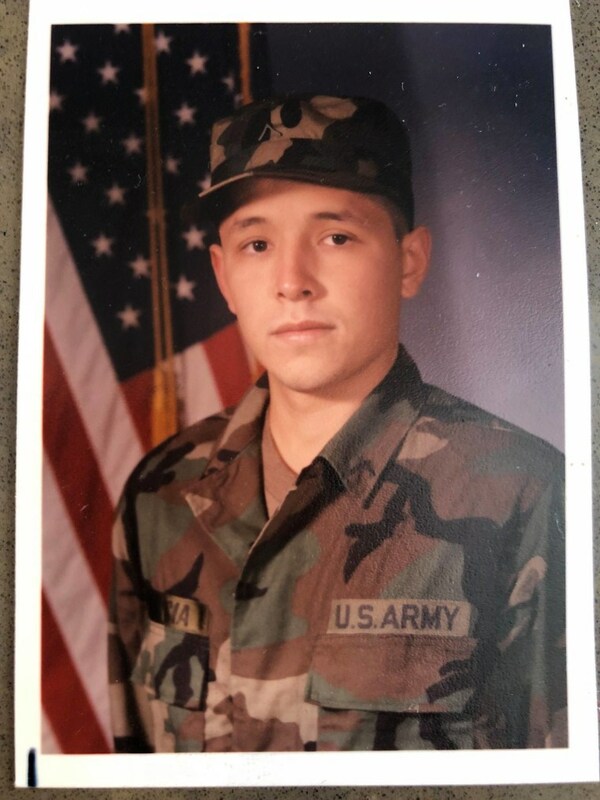 Garcia, a fourth-generation Arizonan raised in a working class family, has a PhD in Education from the University of Chicago, but he speaks proudly of his service in the U.S. Military. An infantryman in the Army, Garcia talks about his service history when confronted by skeptical voters for whom a Latino governor may seem awkward in a state that has become more infamous for its hard line immigration policies. Garcia is confident that his message focusing on increased opportunity, especially through education, and a sense of shared goals will resonate with Arizona voters. “It’s a values question,” Garcia told NBC News as he took a break from talking to prospective voters on a Saturday in June. When asked about the immigration issue earlier in the summer, Garcia said, “I’ve been called an open borders guy from some people, and I tell them, I protected those borders,” he said, referring to his military service. The narrative in Arizona has recently shifted to the state of its education system; studies have pinned Arizona’s K-12 education as among the worst in the nation. Recently, tens of thousands of teachers called in sick to protest the lack of pay and resources dedicated to education as part of the #RedforEd movement, and the state’s #InvestInEd measure recently submitted almost twice the number of signatures it needed to get their proposal on the ballot. In response to the teachers’ protests, Gov. Ducey responded with a “20/20 plan”, which gave teachers at least on paper the raise they were demanding. Ducey’s 20/20 plan says that it will give teachers an incremental raise that will amount to a 20 percent raise by the year 2020. Despite Arizona’s steady economic and population growth and a 4.7 unemployment rate, a recent Marist/NBC poll showed only 26 percent of Arizona voters wanted Ducey re-elected. Gov. Ducey’s 20/20 plan angered many across the political spectrum. “On the right, people were not in favor of Ducey yielding to the #RedForEd movement, and his 20/20 plan seemed like a capitulation. Meanwhile, his plan is ambiguous and even his supporters are not okay with the lack of specifics and how this plan will be carried out,” said Molina. Garcia’s position on education comes with its minefields. He has been clear on his solution for education reform and that is to raise revenue. “Addressing education is not just an education question, it is a tax question, it is a values question about how and where we cut and invest,” he told NBC. Raising taxes, however, is a dicey issue for Arizona politicians in a state where the median age for whites is 46 years old though it’s 26 for Hispanics. The education discussion is essentially about asking older, mostly white Arizonans to pay for an increasingly diverse school-age population, a list of issues that some call the “racial generation gap”. Making the education battle a discussion about taxes would put Ducey on firmer political ground, and he has recently been pushing that message. “It’s Arizona, after all,” said Sanchez, adding he needs to talk about issues that moderate Republicans care about as he seeks their vote. Sanchez illustrates the reality of the climb Arizona Democrats have ahead of them. Despite the attention progressive movements are getting across the state, Republicans still outnumber Democrats in registration; recent records from Arizona’s voter website show that Republicans still outnumber Democrats by almost one hundred seventy thousand registered voters and there are more unaffiliated registered voters than there are Democrats. According to Arizona’s voter website, the voter registration deadline is July 30th and voters will be able to begin voting early on August 1st up until August 24th. Election Day is August 28th. Garcia’s uphill battle to be Governor is largely represented by a registration numbers that continue to favor Republicans, and a midterm election that Democrats have been notoriously incapable of mobilizing voters. However, in a year that is shaping up to be a referendum on President Trump, and with the teachers movement, it may be possible to score an upset. One might be surprised to learn that if Garcia were to beat the odds and become Arizona’s next governor, he wouldn’t be the first Latino to hold that office. Raul Hector Castro won the governor’s seat by less than five thousand votes in 1974 only to resign in 1977 when he was asked to become the U.S. Ambassador to Argentina by President Jimmy Carter. Castro, who died in 2015, said his decision had caused him some regret. No other Latino has won the office since his improbable electoral victory almost 45 years ago. In a conversation with NBC News, Garcia said his candidacy has been a learning process for him and for others, even in his own party.